Workspace Technology offers Excool the leading manufacturer of innovative indirect freecool technology. 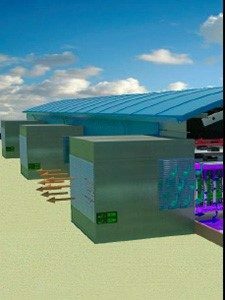 Excool provides indirect ‘closed loop’ energy efficient adiabatic cooling for larger data centre environments. Unlike existing free coolers, the Excool adiabatic cooling system is indirect utilising state-of-the-art ‘heat exchange’ technology which harnesses the adiabatic cooling effect of air and water. The heat exchange technology has been developed specifically for this process. If the outdoor air temperature becomes too warm the integrated control system starts the adiabatic process which reduces the outdoor air temperature entering the heat exchanger. This system will support equipment Inlet temperatures of 24ºc 365 days a year within most of Northern Europe. Improvements in fan technology, the use of inverter drives on all motors, careful design of the heat exchanger and a specially designed control system all ensure that minimal energy is used at all times delivering exceptional PUE ratings. The risk of contamination from outdoor air and the need for regular high-grade filter changes is eliminated by the Excool heat exchange system. As Excool is an indirect adiabatic cooling system the filtration level and associated fan power required are substantially lower. Low cost maintenance – The Excool system requires routine maintenance of filters and the atomising nozzles only. All fan and motor bearings are sealed for life. As an expert data centre design and build company Workspace Technology is continually looking to deliver the very best technology and the most efficient data centre for our clients. Excool adiabatic cooling technology is part of a range of initiatives by Workspace Technology designed to provide our clients with competitive advantage within the data centre environment. Click here to view our Excool Adiabatic Cooling brochure.